The selections in this compilation deal with the meaning and nature of the psychic being, its role and action in the awakening to the inner life, and its influence on the afterlife and the process of rebirth. Many of the extracts clarify the difference between the soul in its purely essential form and the psychic being, which is the soul in its evolutionary, individualised form. 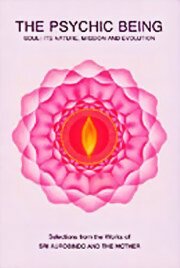 The process of psychic growth and development and the central role of the psychic being in the individual's sadhana are some of the key concepts in Sri Aurobindo's Integral Yoga and are given prominence in this compilation, which is aimed mainly at the general reader. Born in Paris in 1878, the Mother studied painting at an art studio and became an accomplished artist. Primarily interested in inner development, she was associated with several groups of spiritual seekers in France. In 1914 she journeyed to India to meet the Indian mystic Sri Aurobindo in Puducherry and settled there permanently in 1920. For nearly fifty years, she was the head of the Sri Aurobindo Ashram, from its founding in 1926 until her passing in 1973. She also established a school, the Sri Aurobindo International Centre of Education, in 1952, and an international township, Auroville, in 1968.